How you can “spark” new ideas and ignite your sales creativity. Retail sales is both art and science. “Me Inc.,” your company, helps to define who you are, and where you are going. It doesn’t matter if you work for a large retail chain or a small design oriented shop, the creativity you bring to your work, has a direct affect on your life and your company. Many retail sales and design associates just don’t get it. They do the same things day after day. They give the same pitch and work the same approach with every UP They encounter. 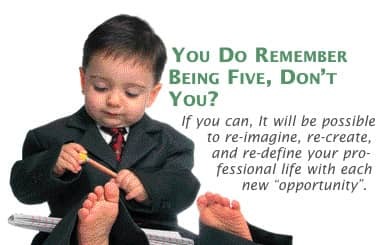 It is possible, however, to re-imagine, re-create, and re-define your professional life with each new “opportunity”. You DO remember being five, don’t you? If not, go play in the rain, hug a tree. Let your imagination out to play. You smiling? I thought so! I hope so! Now we are almost ready to discuss some great ideas that can help you to be more creative, imaginative and productive. Imagination is defined as “the ability of the mind to be creative.” Daniel Webster also defines it as, “vision, creativity, inventiveness, and fantasy.” Walt Disney gave the word imagination physical form when he created the “Imagination Center” at Epcot. To complete his vision, he enlisted the help of a mascot, “Figment,” the dragon. How perfect. An animal known for its fire breathing skills, found work breathing life back into our psyche. Keep Figment in mind as you go through your day. Remember what those mud puddles and finger paints felt like. That “creature” can help you to become “five” again. The question is, how do you nourish the dragon in you? How do you spark new ideas? How do you ignite your creativity? At retail, words take on a whole new meaning. So let’s play with them so that what you say and how you say it will reflect the reality of who you are and what you do. Don’t call your place of business a store. Call it a showroom. Better yet, say what it REALLY is. It’s where you master your craft. It’s where you create. Even the word studio doesn’t begin to describe it. You are a student at the University of Creativity. You are the ultimate professional. Your clients buy from you because of your imagination and ability. This is what sets you apart. Does Cirque du Soleil say that they are a circus? Of course not! Daniel Lamarre, Cirque’s President and COO, calls his concept “a total sensory submersion.” His original vision was not to put on a show, but to “have our clients walk away from our show inspired. They were part of a total sensory submersion.” Sound familiar? Isn’t that what you do? All of your client’s senses must play a part in any good presentation. If “Louise” can’t picture it, she won’t want it. You’re in the picture painting business. Your canvas is wide. Your palate of colors used creatively will create a masterpiece that will bring “Ethel’s” dreams to life. Every day at retail should be different because you are providing your assistance to very real, interesting people. Your task is to make them feel comfortable. You do not have a job that can be done well while on auto pilot. “Roboclerks” need not apply. You are different. You are unique. You need to be out there everyday greeting humans, with a smile on your face. In her terrific book, “Talk to the Hand,” Lynne Truss writes that, “Talk to the hand” specifically alludes to a response of staggering rudeness best known from The Jerry Springer Show – “Talk to the hand, coz the face ain’t listening”, accompanied by an aggressive palm held out at arm’s length. Ms. Truss notes how rudeness has become totally acceptable because manners are fast becoming a thing of the past. Our retail clients want excellent service. They want help. But they might have developed a bad attitude thanks to exposure to poor service and institutional rudeness. Furnishing a home is a process that can be frustrating. So, if you occasionally meet “the hand” just remember that your client wants and needs your help. It’s her home. Furnishing it can be daunting and intimidating. “Ethel” takes this process very seriously. She’s scared and excited all at the same time. She’s done her homework. She’s informed, but she still needs you, your creative knowledge and energy. It’s up to you, the Pro, to make this process easy, painless, and fun. Go on a mission to find inspiring people. “Inspiring people are like vitamins for our spirit,” so says SARK. Who inspires you? Why? How do you inspire you? HAVE a mentor. FIND a mentor. BE a mentor. Spread the word! Talk to your friends and peers about ideas that you are mulling over. Sometimes saying the words out loud, leads to more ideas. Giving voice to your thoughts often helps them to bring them into to light. Then the pieces of the puzzle start to come together. Have a Brainstorming Session with your team. Write down all of your new ideas on a flip chart. I call them Ah Hah! Moments. Post these words of wisdom so that you can see, read, and remember them. I ask people who attend my seminars, “Talk to me. I only steal from the best!” The best marketer I know is Seth Godin. His philosophy, “Start by creating something amazing, something people will love and want to talk about. Something remarkable. If something is remarkable, someone will want to talk about it. Remarkable Marketing: Anything the customer believes is worth remarking on. Edgecraft Marketing: The process of digging deep and being bold to come up with edgy, remarkable ideas. How about you? How much space are you taking up? Just where are you on that ledge? For some people, the fear of succeeding is actually more scary than fear of failing. This fear often manifests as procrastination. It is much easier and safer in the short term to hang back and put off those big risky actions. If you’ll excuse the pun, you get very inventive when you’re flying without a net! “We have to take risks because that’s how we began and who we still are. We built our brand on creativity,” Lamarre continues. Because of this philosophy, Cirque moves from entertainment into the realm of art. “Total sensory submersion.” Get all of the senses involved. Paint that picture. Make it an experience. Get into play. No more automatic pilot or sliding into cruise control for you. Join Cirque at the University of Creativity. Turn each Up into an opportunity. Live in fun! Go find Figment! “The Ultimate Gift” by Jim Stovall: This is one of the best books ever written. There is a life lesson on each and every page. It should be required reading for every human. Use it to learn and grow. Mr. Stovall is blind. Just reading about him on the jacket cover and all that he’s accomplished will have an impact on your life. He gives new meaning to the word inspiration! Some of his other books include, “You Don’t Have To Be Blind to See,” “The Way I See the World,” “Wisdom of the Ages,” and a novel called, “The Lamp.” His latest book, “The Ultimate Life,” is due out in September. “Seventeen Ways to Eat a Mango” by Joshua Kadison: Beautifully written each page looks ragged and old as if its been ripped out of a journal. Experience Mr. Kadison’s adventure as you learn about life and the mango. This is one very special book. “Good to Great” by Jim Collins: Published years ago, it still ranks as one of the best business books out there. If you haven’t read it, put it at the top of your to do list. “The Secret” by Rhonda Byrne: National best seller based on the Law of Attraction and taking ACTION on what you want. Ms. Byrne has put together “writings” from psychologists, philosophers, a metaphysician, and engineers. She even included Jack Canfield co-author of the “Chicken Soup” series. Also, get the DVD on this one, and meet these contributors up close and in person. It’s great! “Crossing the Unknown Sea” (Work as a pilgrimage of Identity) by poet David Whyte: This is a beautifully written book. He really gets you thinking about what you do, and what you’re passionate about. Are they one in the same? “Climbing the Ladder in Stilettos” by Lynette Lewis: Ladies, need I say more! “Battlefield of the Mind” by Joyce Meyer: Joyce Meyer teaches you how to take on, and win the battle in your mind. So many times we let our brain cells go to war with negative thoughts and we put ourselves down, and get ourselves down. Then we let ourselves stay down because we just had a rude one. She gives you the weapons for your arsenal in the fight to get UP and be up for your next Up! “I Can See You Naked” (A Fearless Guide to Making Great Presentations) by Ron Hoff: Written years ago, it’s still the best script to help you get ready, and be ready to take center stage. You’ll get the applause, while “Ethel” becomes the star! “The Generosity Factor” by Ken Blanchard: Yes, the author of the “One Minute Manger” has written another great “fable.” This one lets you know, that it’s not about the getting. It’s about the giving. Sounds like words to live by to me! Cathy Finney is President of Ancell Affiliates\”T ‘N T.” She is a noted motivational speaker, sales trainer, and management consultant. Questions on any aspect of sales training or sales management can be sent to Cathy care of FURNITURE WORLD Magazine, at finney@furninfo.com or call her toll free at (877-FINNYFX). See all of Cathy Finney’s articles on www.furninfo.com in the Sales Skills Article Index. Call 877-235-3095 for more information on her audio learning courses: “Pass the Power, Please!” on retail management; “House Calls” on how to do more and more profitable house calls; and “The Marketing of Me Inc.” on how to follow-up to turn retail customers into clients for life.